On April 24 and 25, Grey County has the opportunity to show the world why it deserves to be named the 2017 Intelligent Community of the Year. Intelligent Communities Forum (ICF) Co-Founder Louis Zacharilla will be touring the region to see firsthand what makes this a connected county. Over the two days, Mr. Zacharilla will take in some of the most notable projects and initiatives from around the county. This includes stops at Georgian College’s marine training and research facility, LaunchPad Youth Activity & Technology Centre, the Bluewater District School Board’s specialized high skills major programs and more. As part of the tour, Grey County is hosting a special event for community and business leaders. Mr. Zacharilla will give a keynote speech about the ICF and learn more about local initiatives, such as the Western Ontario Wardens’ Caucus’ SWIFT project. The ICF decides the Intelligent Community of the Year by scoring each community on six key indicators: broadband, knowledge workforce, innovation, digital equality, sustainability and advocacy. Grey County provided detailed examples of each indicator in their application to the Top 7 Intelligent Communities earlier this year. “Being an intelligent community isn’t just about having the most fibre in the ground. It’s about understanding the unique challenges in your community and finding smart solutions that benefit everyone and help the community prosper in the broadband economy,” said Myers. Grey County has played a leading role pursing the Intelligent Community of the Year award, but the efforts wouldn’t be possible without the innovative work of local municipalities, businesses, groups and individuals. “Grey County deserves to be on the top of the list for Intelligent Community of the Year. We are far from the largest community on the list, but amazing things are happening right here in our own backyard,” said Grey County Warden Alan Barfoot. The Intelligent Community of the Year award is presented annually by the ICF to the community that scores the highest on six key indicators: broadband, knowledge workforce, innovation, digital equality, sustainability and advocacy. The Intelligent Community Award is broken into three phases: Smart 21, Top7 and Intelligent Community of the Year. 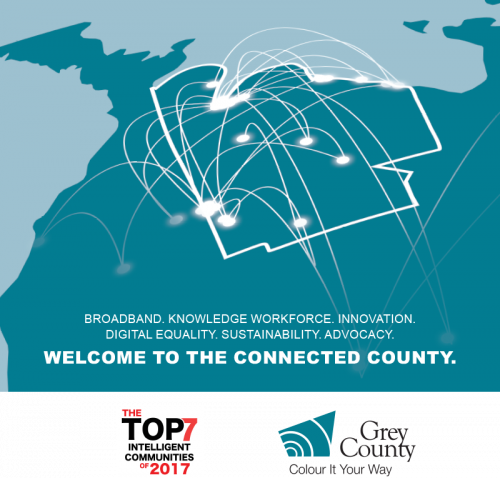 Grey County was named to the Top7 Intelligent Communities of 2017 on February 9, 2017. The most recent winners of the Intelligent Community of the Year award include: Montreal, Quebec; Columbus, Ohio; Toronto, Ontario; Taichung City, Taiwan; and Riverside, California. Grey County’s support for SWIFT (Southwestern Integrated Fibre Technology) Network. SWIFT will address major gaps in broadband access. The Shared Purchasing Service Consortium of Grey-Bruce is a partnership of local government, schools and hospitals combining resources to create a broadband network. Grey County has committed $1 Million to support network improvements in partnership with the private sector. Supporting regional and rural broadband research (R2B2). Youth skills development at LaunchPad Youth Activity & Training Centre in Hanover, ON. The Marine Emergency Duties Training and Research Centre at Georgian College in Owen Sound. Bluewater District School Board Specialized High Skills Major programs. The Ag 4.0 conference and innovation tour in 2016 focused on the intersection of agriculture and food with technology in the digital economy. The Employer One survey that analyzes the local labour market so data can be shared with schools, governments and community partners. The Owen Sound and North Grey Union Public developed Library2.Now as an innovate way to approach staff training and to encourage the use of technology. The initiative has expanded across the country. Grey County working to bring free Wi-Fi to residents in affordable housing units at Alpha Street in Owen Sound, ON. The United Way’s Computer Refurbishment Program providing free computers to low income families. Redevelopment of the Grey County website making it easier to use and navigate, mobile friendly and responsive, and accessible. The Grey Bruce Data & Information Sharing Collective, a group of non-profit, social service, government, health and education organizations that share information for decision making and planning. Planning and local food collaborations with the University of Waterloo. Innovative product and service delivery by local businesses and institutions. Bay Growers state-of-the-art apple sorting, packaging, storage and distribution. Aspin Kemp and Associates consulting developed the world’s first hybrid diesel/electric tugboat. Third Line Homes dousing development in Meaford used Durisil, an environmentally friendly and breathable wall material. The Movin’GB rural coordinated rural transportation pilot with Home and Community Support Services. FSC Sustainable Forestry Certification of Grey County forests. Grey County owns more than 8,500 hectares of forest. Recolour Grey, the review of Grey County’s official plan. The announcement of the Intelligent Community of the Year will be made this June in New York City. For more information contact Rob Hatten, Communications Manager at rob.hatten@grey.ca or 519-372-0219 ext. 1235.